Sterling Silver 1 carat center CZ Cubic Zirconia Pave' Round Brilliant Side Stones Wedding Engagement Ring .925 Sterling Silver Reproduced with Beautiful, Hand-Crafted, top quality Jewelry workmanship!... 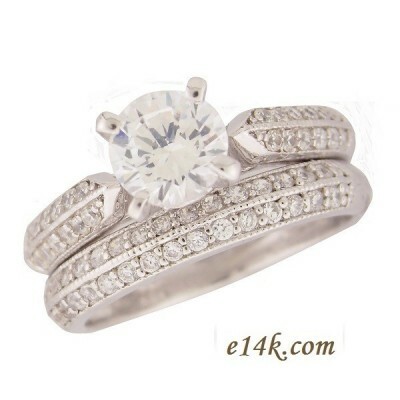 (These Russian CZs are more precisely cut & polished from the finest quality CZs) Satisfaction Guarantee! Picture does not do justice to this piece! Matching Wedding Band included!